Dandelions are one of the many “weeds” that Americans spend a good amount of time trying to rid their yards, driveways, and sidewalks of. For no reason at all these poor little plants have been deemed the more hellish thing to crop up in a suburban piece of land. Few realize the number of wonderful things that can be made out of dandelions. Their leaves can me sauteed and eaten dressed with butter, vinegar, or anything else the pallet prefers. The heads had be used to make dandelion wine. There is such a thing as dandelion syrup, which I hear is delicious. 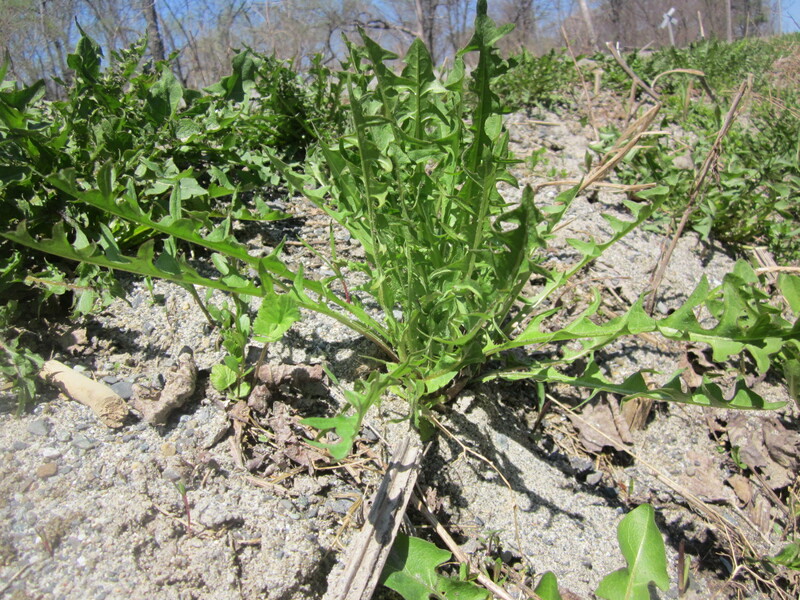 The entire plant can be fed to numerous critters to supplement their diet. Not to mention the seed heads can keep a toddler entertained for hours on end. One way that dandelions can be used is as a detoxifying tea which can help shed water weight and flush the kidneys – in turn helping to balance hormones. Now that this wonderful little tea has become a staple in our home, I decided it was time to dry some out myself. I was in for a bit longer of a process than what I expected. 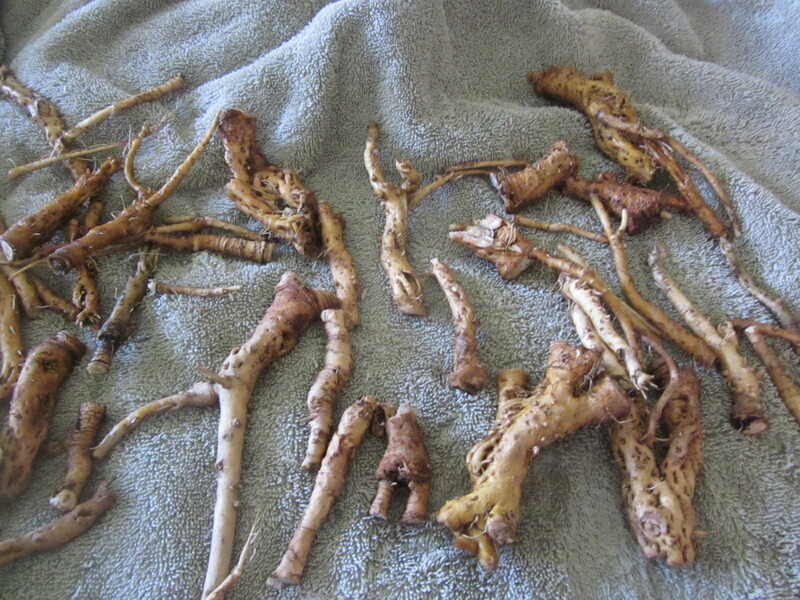 A note to those trying to dig out dandelion root for the first time: do not try to dig in an area where the plants have been unharrassed. 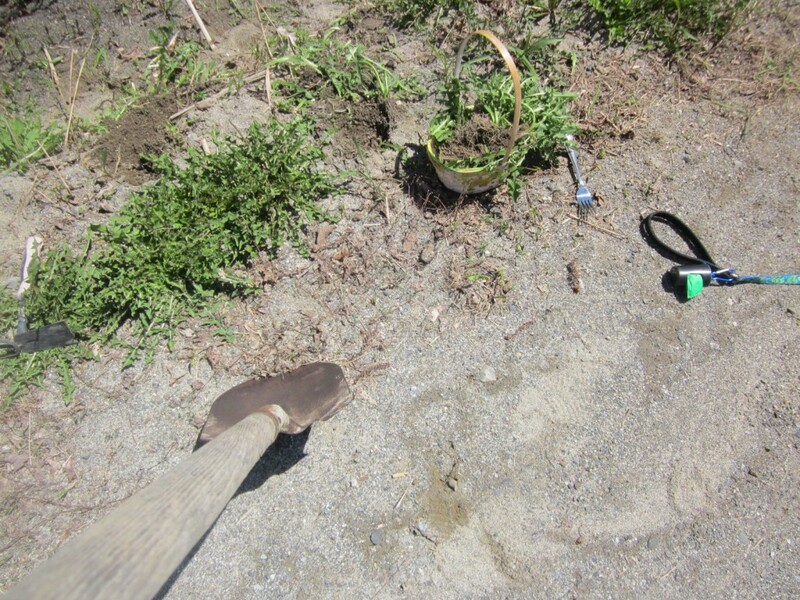 I quickly found myself using a spade, trowel, and a kitchen fork to try and dig this bugger out. Diamond (who’s leash you see in the photo), just looked at me like I was a crazy woman. I moved down to our back lawn and near the stream and had much better luck. There seem to be two key things to look for to have success with this: 1. sandy soil and 2. young plants. The younger the plant, the smaller the tap root. While that means more that need to be collected, that also means an easier time pulling them out of the soil. If you look at the photo above, you can easily tell the younger plants (fairly straight, thinner tap roots) from the older ones that are wrapped around one another, forming an alien looking tuber. After getting a decent size haul of plants, I double washed them in the stream and then lobbed the tops off. (Both the rabbit and chickens were delighted to have fresh veggies delivered right to them.) I then brought in the roots for a good scrubbing in fresh, cold water, and let them work on air drying while I diced them into roughly uniform sized slices, leaving the really thing ones in lengths of roughly one inch. The key to drying is to wait until the roots are crumbly and can be broken down by hand with no sponginess left. 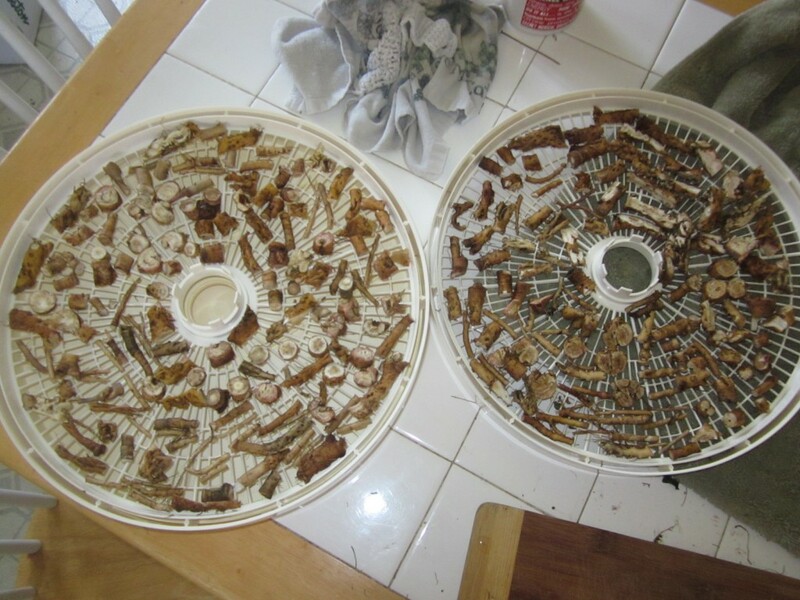 For my slightly older dehydrator it took about 12 hours. Supposedly this can be done via air drying, but living in a humid climate, I wasn’t about to try it. 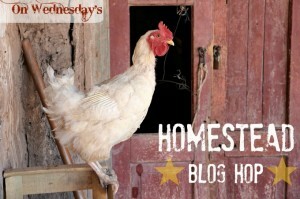 Connected up on the Homestead Blog hop! Fiddlehead season normally doesn’t hit until around Mother’s Day. That’s when the rush starts to get to the woods and pick what you can before there delicious little ostrich ferns are grown. It’s also the rush to beat people that foolishly pick and sell them instead of stocking their own larder with these delicacies. 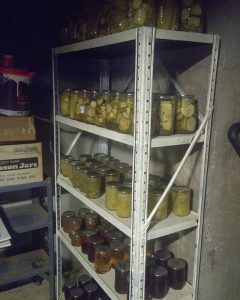 Last week my friend in Vermont posted that she snagged five pounds on her hunting trip. 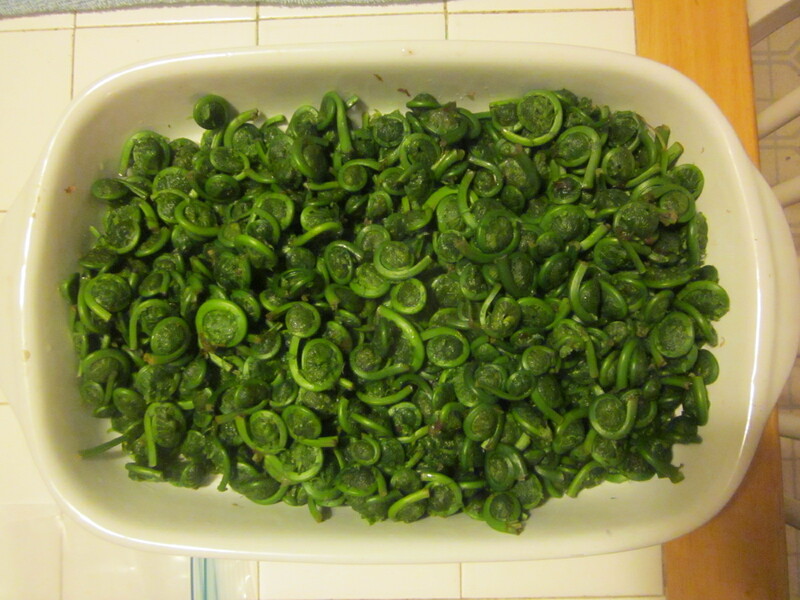 It was the only game to be had that day, but five pounds of fiddleheads is nothing to balk at. I started getting itchy. If they were up in Vermont they were certainly up here in Maine. All laying birds need calcium to make sure that their egg shells are hard enough to withstand being delivered. Calcium supplements are cheap enough, but there’s an even easier way to do it! 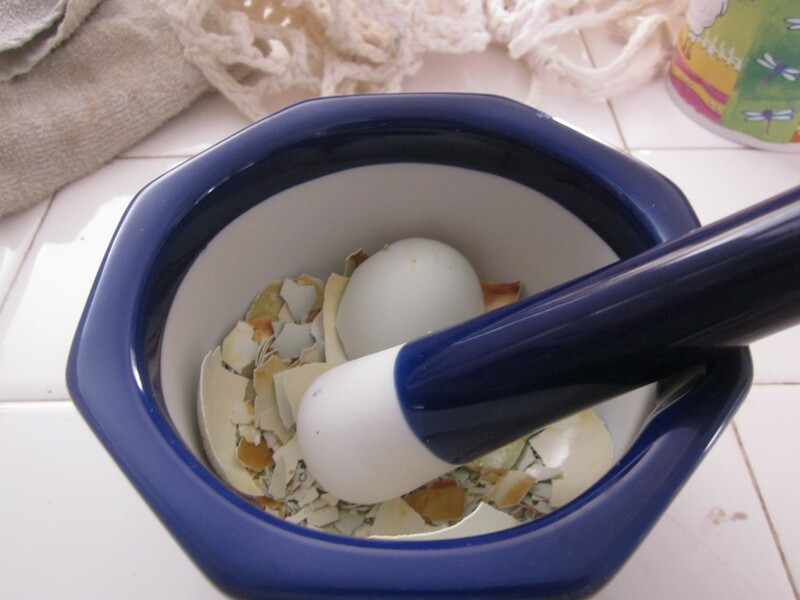 At first the idea of saving egg shells to feed back to the very chickens that laid them made my stomach a little queasey. Then one day, while reading about placenta encapsulation, it hit me: animals eat their placentas when they give birth, feeding the shells to my chickens is the exact same thing. For some off reason, this made everything click for me. It’s an easy enough process to do. 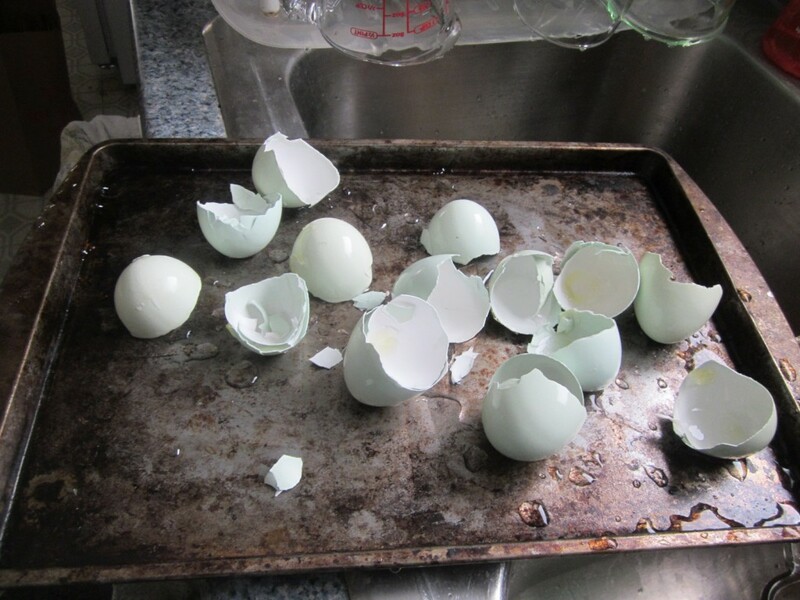 After using the eggs, I rinse the shells in cold water to clean off any left over. I then toss them on a sheet pan. (Don’t judge me on the condition of my pan – this baby has been through a lot!) I turn the oven on to 250F and those the shells in while the oven is heating up. I leave them in there for half an hour or until I remember that they’re toasting away. After the shells cool, I use my mortar and pestle to work them into as fine of a flake as I can. 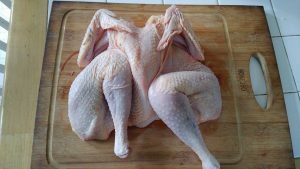 I know that some people feed the shells to their chickens without breaking them up, but to me, that’s just asking to convert these ladies into egg-eaters. There you have it – free calcium supplements for your girls! The past few days have given us a well needed break from the sub 30F temperatures that gobble up the wood, but today is the last of that. Tomorrow the temps dip back down below 20F during the day and below zero at night. While the last stretch wasn’t too horrible to endure, thanks to the backup heat of an oil furnace and an abundance of maple and birch for a wood source, I’m a bit concerned this next one might be a tad more difficult. We’re now into a cord of willow. Many people refuse to burn willow. It burns hot and fast. It means more reloads and less of a chance that there will be coals in the morning. Given that it was split in early December – after being cut for the appropriate amount of time – and that it was from a tree larger than 24″ at breast height, some of the wood is fighting to dry out still. That means stacking it in the house before using it. Prepping for this next snap also meant busting out more kindling as we’ve used up much of what I prepped in the fall. 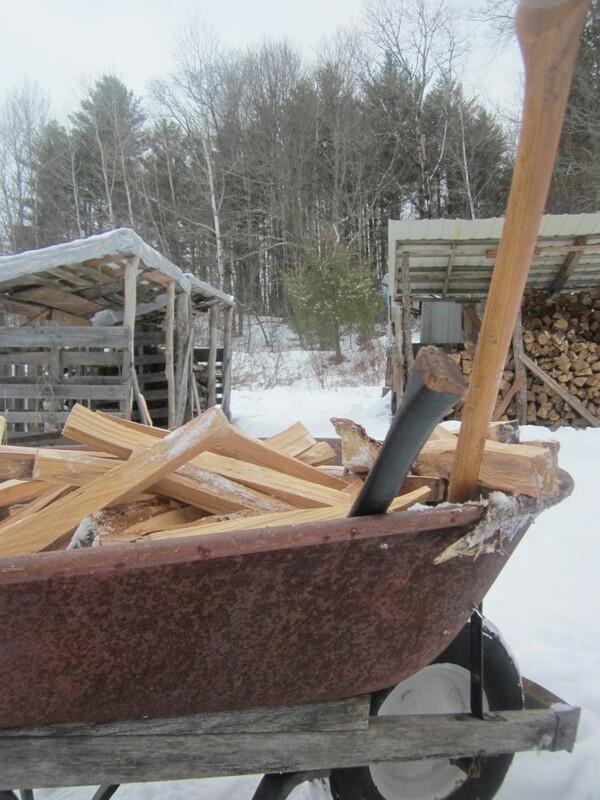 While Little Mister played in his room, I was able to move to the front wood bin the wood for the next day or so and work out a wheelbarrow full of kindling. Even though it will be cold out tomorrow, here’s hoping I get the chance to get another load in. It might be willow, but it will burn.